I have shared any "Scrapping with Scraps" inspiration in a bit and thought today would be the day to tackle some of those precious 3x3 scraps that I have been saving! Yes 'tis true, I save papers 3x3 and larger...and well, my offcuts bin is overflowing! Eeek! Here is a super fast layout using some of those 3x3 scraps! Those clouds are punched from 3x3 scraps; the pattern paper blocks have been trimmed to fit and I carefully pieced together the title block of pattern paper. I am pretty happy I have slimmed up my offcuts bin! Supplies: A previous monthly Scrap Shotz kit! I'd love to see your ideas too! 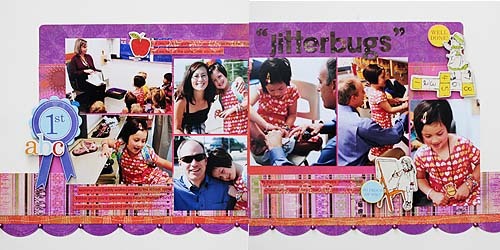 From time to time I look at my finished layouts and think, "What does scrapbooking mean to me?" Really, what does it mean to me? I have a cozy scrappy area that is well stocked with scrappy goodness; enough scrappy tools to put a permenant smile on my face and enough adhesive to scrap for the rest of the year. 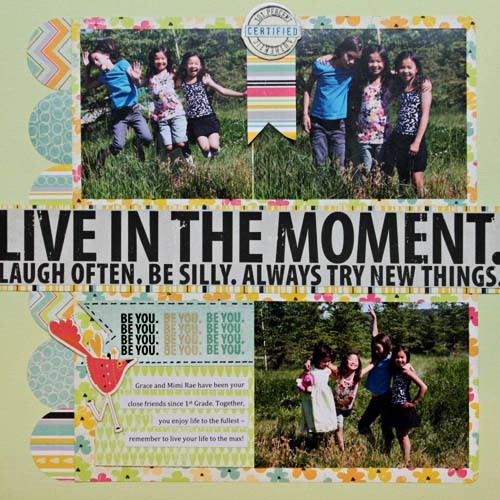 But I wonder...what does scrapbooking really mean to me? Well, scrapbooking to me has opened my eyes to my life and lives around me. Some weeks I am heads down busy and forget to enjoy everything around me. 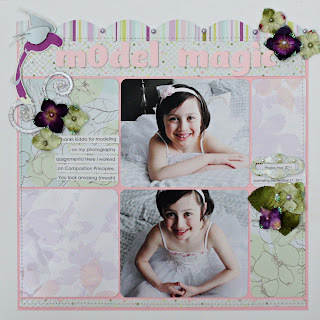 The layout below puts a smile on my face and reminds me that scrapbooking has made me smile and appreciate the everyday...always! 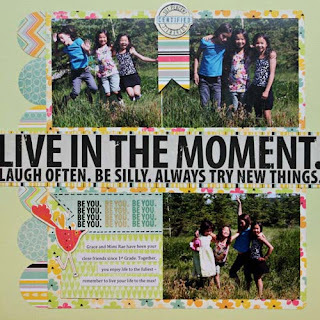 So what does scrapbooking mean to you??? September means back to school for most of us. At my house, the first week was a mish mash of nerves, excitement and deciding what to wear! :-) Take the time to document not just the first day of school but the first week or two of school. In years to come, you will be so glad you did. Here is a layout of my youngest on her first day of Kindergarten - I am honestly not sure who cried more, me or her! What back to school memories do you have to share? I would love to hear about them. Do you have a set style? Do you like "certain" colours and pattern papers? Do you venture out of your box often? I try often to push myself, a little here and alot here. As you all know, I love vibrant bold colours and patterns so soft muted colours and patterns are a bit foreign to me. But it is SO fun to challenge myself. Hope you like it! Go on now and give it a try! Try something different!